La Prairie is launching next month a new helper against wrinkles. It is called Anti-aging Rapide Response Booster. When it comes to fight against wrinkles, every day counts. Now, with the Anti-Aging Booster Rapid Intervention, a new dimension is offered to you in terms of timeless beauty in just two weeks. Formulated with a targeted delivery system, it releases next generation ingredients exactly where your skin needs it most, the cells responsible for the production of collagen and elastin, and this from day one. Over the two weeks of treatment, wrinkles and deep lines seem to disappear, revealing a dramatic improvement in the appearance of the skin. How does it work? The new Anti-aging Rapid Response Booster has a neuro-calming natural peptide that helps control skin aging, blurring the appearance of deep wrinkles and enhancing the protective barrier of the skin to retain its moisture. In addition, a special plankton extract will exfoliate the surface of the skin and redensify instantly its grain. The botanical brightening complex (a mixture of active ingredients from five different plants) and Silver Vine extract helps the tonicity of the skin. Combined with the exclusive Cellular Complex by La Prairie, this anti-wrinkle care offers an outstanding youth protection to your skin. as 80% of skin aging signs come from external/environmental elements, La Prairie experts have developed formulas that address all aspects of fine lines and wrinkles. 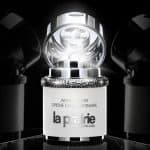 La Prairie developed a consistent and complete range of products that will plump, fill, smooth the surface of the skin and reduce facial expression wrinkles. Each product formula contains a revolutionary anti-wrinkle technology. Your skin will rejuvenate and your look will be much brighter. Each product is quite easy to use and can be applied in different combinations, so each person can have his own beauty protocol. One of the amazing facet of the new Anti-aging Rapid Response Booster, is its formula texture. It easily penetrates the skin, and you feel immediately a response. Your skin seem healthier and tonic. Another interesting detail is the on-off system that can be controlled via the metal ring placed below the delivery pump. After all, few wrinkles can add character; they express an experience. By cons, deep wrinkles only add the weight of years. The Anti-Aging Collection prairie offers a precise advanced Anti-Aging technology and focus to work deep in the fight against wrinkles at their source. Info sourced at La Prairie official communication release. All content is copyrighted with no reproduction rights available.